Thursday, May 31st, 2018 - Categories: Climbing, Uncategorized. We can’t let these longer, warmer days of sunshine go to waste and the Edgeworks Guides have been out making the most of it – climbing and guiding at our local PNW crags and beyond! It is the “beyond” that this month’s trip report will focus on. More specifically, rocks colored “Red” and called “Smith“. Because while mountainous states like Washington and Colorado are experiencing finicky weather with cleansing spring showers, other areas are getting warm and dry sunshine, springtime in the desert and high desert areas of the western US are amazing for climbing. In early April, Andrew met up with Edgeworks’ patron, Neil, for a couple of days of training in the “alpine” like areas deep within the canyons of Red Rock State Park in Nevada. They climbed some stellar classic routes, including Crooked Crack, and had great success exploring unknown climbing deep in Pine Creek Canyon. It was a fun couple of days moving in the warm dry environ! 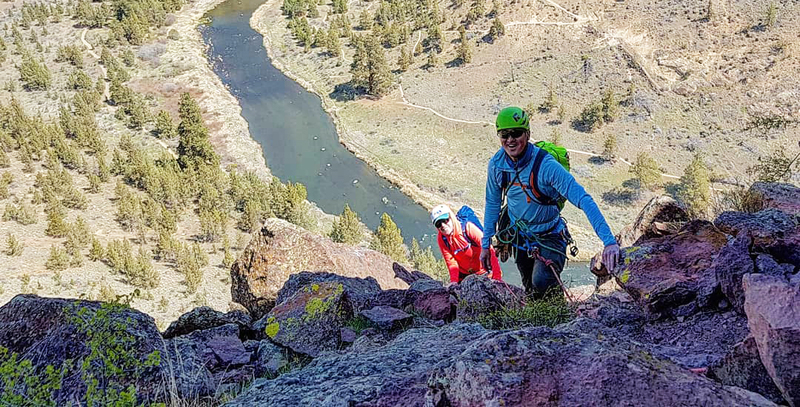 2 weeks later, Edgeworks all-stars, Erin and Ryan, joined Andrew at Smith Rock State Park for two days of climbing and got the full tour of the park located in Central Oregon. They climbed a handful of classic routes such as Cinnamon Slab, and some lesser known classics like Trezlar. With Andrew as their guide, Erin and Ryan, enjoyed 2 full days exploring the park and climbing in areas that most people never visit. This is the time to get out to the dry parts of the world, like Vantage, to hone your skills and brush up for the fast approaching season. Edgeworks guides have expertise in the climbing areas we visit and can show you a place like you have never seen it before!